It’s cool. It’s vaguely medicinal-seeming. It’s made with stuff you could find in body wash or the Bible. At one point, it definitely probably might have contained opiates. It’s Fernet-Branca. But Fernet-Branca is also rich, seductively complex, and blissfully challenging (trust us). It may or may not cure your hangover, and will definitely make you seem cooler in many social settings. Here are 10 things to know about it. “Fernet-Branca” is the Band-Aid of booze. Not for fixing your body (for that, see “cholera treatment,” below). Fernet-Branca is like Band-Aid or Kleenex or Q-Tip: a brand name so well-established it becomes synonymous with the category. In truth it isn’t even the only “fernet.” Fernet-Branca did popularize the category, though, and is likely the only reason many of us started craving that strange, root-y, “this-Birch-Beer-dropped-out-of-grad-school-to-play-jazz-fusion” complexity of any other fernet liqueurs. It’s the real San Francisco treat. Fernet began as a cholera treatment. Fernet’s backstory actually has roots — no pun intended — in naturopathic medicine. Or, more accurately, the unlikely crossroads where centuries of naturopathic medicine collide with robust capitalism. Fernet-Branca founder and “self-taught apothecary” Bernardino Branca began providing Milan’s Fatebenefratelli hospital with his recipe during a particularly bad 19th-century outbreak of Asiatic cholera. While it certainly wasn’t a cure, the stuff seemed to help — and, like Dimetapp, just so happened to taste good. From there it was a matter of distilling and marketing, with Fernet-Branca being taken for everything from menstrual cramps to digestion issues to virility. Five of its 27 ingredients are mixed in a secret room. One of Europe’s first female entrepreneurs ran the company. Fernet founder Bernardino Branca’s son Stefano died in the late 19th century, but the distilling didn’t stop with him. Instead, Stefano’s wife Maria Scala Branca took the reins, becoming one of the first female entrepreneurs in Europe. When Scala Branca stepped down, her son Dino took over, ushering Fernet-Branca into the 20th century by falling back onto its “medicinal” roots as a way to sidestep Prohibition in the new American market. They have pretty cool posters. Chalk it up to the Milanese heritage, we guess? There’s one with a dancing alligator (crocodile?) and one with two aquatic ladies battling (playing?) in the ocean. 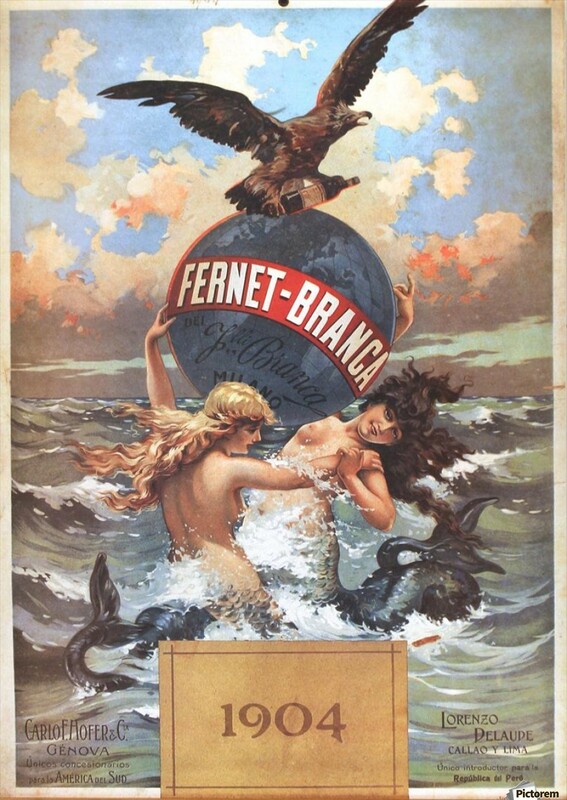 Fernet-Branca was one of the first liquor companies to successfully parlay the mood of a drink into a clear, “cool” visual aesthetic. The company began marketing with well-known artists in the late 19th century, but it wasn’t until 1893 that prolific Italian poster artist Leopoldo Metlicovitz designed the brand’s now-famous, oft-tattooed eagle logo. And but for the inevitable marketing aberration, they’ve stayed cool ever since. It’s a handshake in a glass. If you’ve ever been intimidated in a cocktail bar — was it the quiet jazz? the ironic taxidermy? the word “bespoke” all over the place? — fear no more. There’s a not-so-secret shortcut to your bartender’s heart, and it’s Fernet-Branca. Just saunter up, casually adjusting your suspenders all the while, and order a shot of Fernet. And, just like that, you’ll have enacted the ritual known as “the Bartender’s Handshake.” In some circles ordering Fernet shows you can handle some professional-level, palate-smacking complexity in your glass. It won’t always work — and, as with all “tricks” of intoxicated socializing, please don’t use it to try to get a phone number — but here and there it just might be your shortcut to a lasting bartender friendship. Chicago-based brewery Forbidden Roots consulted with Fratelli Branca distillery to transform the 27-ingredient digestivo into a 20-ingredient beer approximation, specifically an imperial black ale that’s as close to a stein of Fernet anyone in their right mind is likely to drink. Unfortunately for Fernet lovers, the beer — called Fernetic — was a limited release. And it’s Argentina’s national drink. Bartenders, San Franciscans, and the desperately hung over all love it, but if you really want to go to a place where the Fernet-Branca flows like, well, wine, head to Argentina. The country is so collectively enamored of the chicory-brown liqueur they drink upwards of 75 percent of the global supply. Maybe it pairs well with Argentinian beef? (We can imagine the brown savoriness of the Maillard reaction could make nice with Fernet’s dark brown complexity. Hmm.) Or, more likely, Fernet’s popularity skyrocketed because a really good marketing team positioned it as part of a cocktail with Coca-Cola in the ’90s. Argentinians began ordering it as a “90-2-10,” or one-tenth Fernet to nine-tenths Coke and two ice cubes. Proportions change, but Fernet con Cola is still Argentina’s national drink.